Yesterday I made the most amazing tapioca pudding. 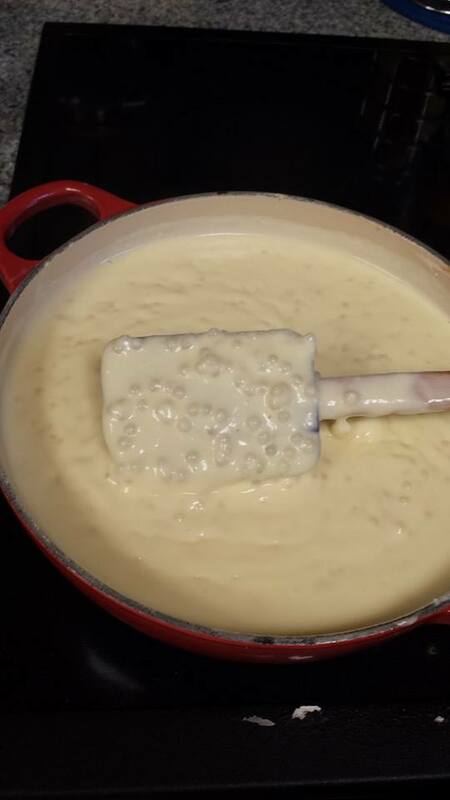 I know that not everyone likes Tapioca, but if you want to try the creamiest, most delicious tapioca ever then I suggest you just give this one a try and you just might find that you actually do like tapioca. I find that the commercial brands are blah and flavorless and the pearls of tapioca are really quite like chewing on a rubber BB for a Red Ryder BB gun. Not appealing at all. Now if you want quick then this isn’t the recipe for you, but I think you will find that the time that you put into it shines in the end and is definitely worth the effort. You just might find that you will never make pudding from a box again!! (besides what is better than serving your family something made with love, from scratch and you actually know for sure what is in it)!! Reduce heat to low and simmer for 5 minutes, as it simmers add in the sugar slowly stirring constantly to combine. Next you need to temper your beaten eggs. (to avoid curdling) Remove a ladle full of hot liquid from pan and while whisking constantly, drizzle in the hot liquid until combined. Add the tempered eggs to the pot of tapioca and stir to mix. Slowly bring mixture to barely a boil, stirring constantly. Reduce heat and stir for several minutes at a low simmer, stirring constantly until you get a nice thick pudding. (the pudding will thicken more when you chill it). Remove from heat and let cool for 15 minutes. Add vanilla. Serve this pudding warm or chilled, either way it is delicious!! If you want to chill it, place it in a bowl and cover with plastic wrap or in a covered container. As with all my recipes, if you try them please come back and let me know what you think. I love feedback and constructive criticism. I tried this. It is beyond description. Creamy yet chewy, sweet and satisfying!